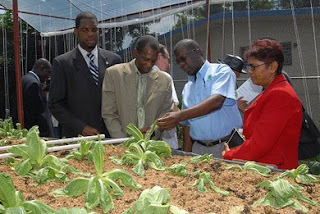 The National School Garden Programme was officially launched today (October 10), under the theme: 'Youth Response to Food Security', during a ceremony at Jamaica College in Kingston. "Over a three year period, the main goal is to implement approximately 1,000 gardens in primary, secondary and tertiary level schools across the island. I am very pleased that the programme has been receiving overwhelming response and 340 schools have so far been registered, including schools with existing gardens that are being assisted with technical support and inputs," Mr. Hutchinson said. this is great to see. i hope more programs like this begin. I agree - it would be good to see projects like this happening in more places across the US - especially in the nation's cities. I do know that when these programs are implemented in developing nations, there are some unplanned consequences. I wonder where Jamaica fits in this picture?